Sound: Believe or not, the number one reason why people get water features on their pools is more for sound and less for looks. Simply put, there is just something very tranquil and relaxing about floating in a pool or laying out on a deck and listening to the sound of cascading water. Aesthetics: Although sound is quite nice, the beauty a water feature can add to a pool project can be quite dynamic as well. Whether you’re going for a simple, 18” cascade that comes off the side of the pool, or a dynamic, 10’ grotto that is the talk of the neighborhood, water features can be quite pleasing to the eye and very much enhance the look of one’s backyard. Fun to Play In: My swimming pool has a very simple water feature on it called a ‘Wonderfall’. 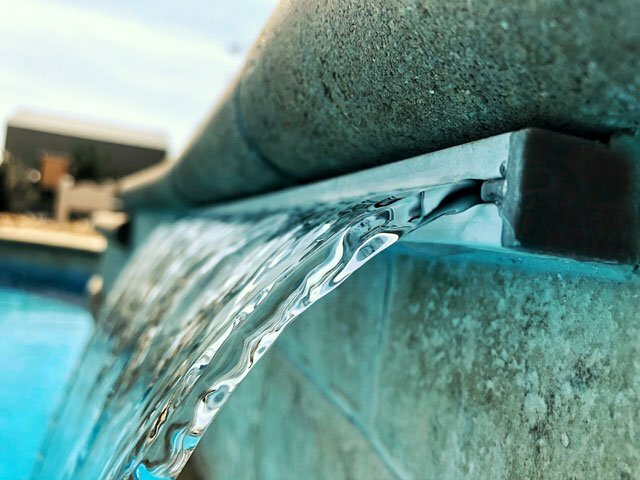 Basically, it’s a small piece of plumbing that connects to one of the pool’s returns and uses the water pressure from the return to create a spraying water feature. Because this little tube can be rotated and manipulated, the kids have a blast spraying it at each other and also floating under it to get a simple ‘cool-off’ while on a raft. So there are 3 reasons to consider some type of water feature on your swimming pool. As always, if you have any questions or comments regarding this or any other pool topic, don’t hesitate to leave your thoughts below.